Carl Crozier’s new book “Some of My Heroes Died in the Riots” is the true-story about a young black man’s memories and experiences while fighting for civil rights. Recent release “Some of My Heroes Died in the Riots” from Page Publishing author Carl Crozier is both emotional and educational; this work delves into the history of civil rights, riots and the movement toward equality. Carl Crozier, a spectator during the civil rights era, manager in corporate America, writer and author, has completed his new book “Some of My Heroes Died in the Riots”: a gripping and potent work that delves into the ideas of racism, equality, freedom and acceptance. Published by New York City-based Page Publishing, Carl Crozier’s telling work will captivate and enlighten the reader. The urban riots that happened in the African American communities during the nineteen sixties were not planned events. They spontaneously happened as a result of some occurrence and feelings of estrangement, marginalization, disparagement, and disrespect by America of black people as evidenced by history and the events of that era. Each time that members of the black community took to the streets and caused mayhem, it brought embarrassment for America, which was supposed to be the land of the free and home of the brave. This book chronicles some of the history that led to the riots and the events of the time, as seen through the eyes of an ordinary, young, coming of age black man endeavoring to find his way in America and to acknowledge unrecognized participants in the fight for civil rights. 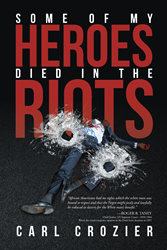 Readers who wish to experience this prolific work can purchase“Some of My Heroes Died in the Riots” at bookstores everywhere, or online at the Apple iTunes store, Amazon, Google Play or Barnes and Noble.